Poker ranks as the most played and influential card game in the world and has become an absolute staple in both brick-and-mortar and online casinos. As a matter of fact, it is next to impossible to imagine a casino where the game is not available. Unlike other casino games like roulette and craps, which are based entirely on chance, poker is by and large considered a game of skill as it calls for a good amount of discipline, composure, risk assessment, and understanding of probability. Today, an impressive number of variations of the game exist, with Texas Hold’em, Omaha Hold’em, Seven-Card Stud, and Five-Card Draw Poker being some of the most popular ones. Various prestigious tournaments are held on a regular basis with players competing not only for colossal monetary prizes but for the opportunity to claim the coveted champion title. But when, where, and how did it all begin? The origin of poker is difficult to trace back since it is as much unclear as it is debated. Various theories suggest the game evolved over ten centuries ago and crossed several continents until it became what we are familiar with today. Poker started out as a combination of different games which shared the same basic rules as well as the principles of card ranking and bluffing to mislead and outplay one’s opponents. Some of the earliest recordings of a similar game being played point back to late 10th-century China, which is hardly surprising considering the Chinese were the nation to invent playing cards to begin with. A Chinese emperor allegedly engaged in a similar game with his concubines where the so-called “domino” cards (or tiles) were used. The game gained popularity across the entire Empire. The only difference was the poor Chinese peasantry could not afford domino tiles, so they had to settle for playing with leaves, which is why the game was nicknamed “The Leaf Game”. Originally, the deck consisted of 32 tiles, which were divided into two suits – civil and military. It is precisely the concept of suits that allowed for the introduction of a higher level of strategy in the game as it was impossible for the tiles from one suit to beat those of the other suit, regardless of their rank. 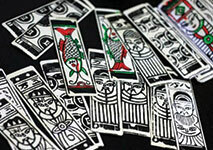 Evidence suggest Egyptians are known to have engaged in some form of card playing as early as the 12th century. 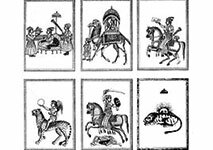 Another theory traces poker’s origins to an earlier form of playing cards that dates back to the 16th-century Persian game Ganjifa. The game is believed to be the predecessor of all card games as its name loosely translates as “Treasure cards”. A Ganjifa deck contained a total of 96 elaborately drawn cards. These were crafted from slices of expensive ivory or precious wood that were as thin as paper. A game similar to Ganjifa, called Ganjapha, gained prominence in India. However, the Indians utilized palm leaves or turtle shells to craft their decks which consisted of round cards. Ganjifa is largely considered to have laid the foundations of yet another card game, As Nas, which gained enormous popularity throughout Persia in the 17th century. As Nas was played with 25 cards and utilized hierarchical hand rankings and betting rounds, similarly to poker. As the cards lacked any indexes or titles, the only way for players to recognize what hand they held was by the cards’ background color. As a matter of fact, As Nas bears a striking resemblance to what we call “poker” today. There were hands of different value and players reportedly implemented bluffing, called “tup zadan”, to mislead their opponents. In 1895, Persian scholar Albert Houtum-Schindler described As Nas as a game that is precisely like poker, minus the flushes and the straights. According to Houtum-Schindler, As Nas was played by five players and each one was dealt five cards. The dealer then puts down their stake and the players were provided with the option to either fold, cover the dealer’s stake, or raise it. The game of bouillotte that was played in 19th-century France, is also believed to a predecessor of poker as it was based on similar principles. Card games, similar to As Nas, traveled to Europe after France and Italy started trading with merchants from the Middle East. However, it is the French game poque that is believed to be the closest predecessor of poker. The game gained huge popularity in 17th-century France. Both poque and its German equivalent pochen derived their rules from the Spanish game primero, where each player was dealt three cards and relied on bluffing to prevail over their opponents. Although the betting structure and the hand rankings in poque largely coincided with those if poker, the former was played with a deck of 32 cards. Being a nation of colonists, the French imported the game of poque to the city of New Orleans, which became part of the United States after the Louisiana Purchase in 1803. The first records of poker being played date back to 1829. As reported by the English actor Joseph Crowell, this early version of the game was played around New Orleans and allowed for up to four players to join. It utilized a 20-card deck which consisted only of the tens, the jacks, queens, kings, and aces. The game quickly took off, with Americans gradually adopting the name “poker” instead of the French “poque”. Poker became an instant success among the crews of the Mississippi riverboats, who spread it throughout the country. One of the earliest, official references to poker was made by American inventor and writer Jonathan Harrington Green in 1834. Green, who enjoyed betting himself, refers to poker in one of his writings as the “cheating game”. Arguably, poker was officially born when Green documented the “cheating game” and outlined its rules in his 1843 book An Exposure of the Arts and Miseries of Gambling. The game was played by both Confederate and Union soldiers during the Civil War and became an absolute must in the saloons of frontier settlements in the American West. Some participants resorted to cheating, so disputes among saloon players were often resolved with guns or knives. Because of this, poker was frequently associated with outlaws and violence. It was next to impossible to find a legitimate, fair game where the participants did not cheat since lawlessness ruled over the entire West at the time. More and more changes regarding the rules were made, some of which were borrowed from the English game brag. The deck was extended to feature 52 cards, allowing more players to participate. Two new ranking hands were added, the flush and the straight, alongside the draw feature. The game took the entire country by storm. By the second half of the 19th century, there was hardly a saloon without a poker table in the United States. By the end of the century, two major variations of the game had evolved – draw and stud poker. Five-card stud poker prevailed among players from the West, especially during the Gold Rush in California. The main difference was that in stud poker, players could see some of their opponents’ cards. While in draw poker one was allowed to discard some of their initial cards and draw new ones from the deck, this was not the case in stud poker, where participants had to play with the cards they had been originally dealt. The evolution of stud poker did not end there – later on, the number of cards was extended to seven. In 1875, some variants of the game adopted the joker as a wild card. A set of definite poker rules was officially outlined for the first time in 1905 in R.F. Foster’s book Practical Poker. Unfortunately, only five years later, in 1910, gambling was proclaimed illegal on the territory of Nevada. The state’s Attorney General argued he could not prohibit people from engaging in draw poker because it was based on skill and the new anti-gambling legislature did not apply to it. On the other hand, stud poker was declared illegal because it was seen as a game of chance, at least from a legal perspective. This caused draw variations to gain even greater popularity among players. Meanwhile, despite the fact stud poker was proclaimed illegal, this did nothing to prevent enthusiastic poker players from participating in their favorite game. Many fans of the stud variation would gather and play for real money on the sly. Things took a turn for the better in 1931, when gambling was officially legalized in Nevada. The state became the only place in the country where citizens were allowed to legally partake in gambling activities. Thus, poker made it from the back parlors to the floors of some of the most luxurious casinos in Las Vegas and the rest as the saying goes is history. Tournament poker was born in the 1970s after the start of the World Series of Poker (WSOP). It was then that Texas Hold’em started to gain prominence as it became the title game of the WSOP. In Texas Hold’em, each player is dealt two hole cards that are facing down. What was new in this variation was the introduction of the five community cards. These are dealt in three stages and are facing up. The first three community cards constitute “the flop”, the fourth card is “the turn”, and the fifth and final card to be dealt is known as “the river”. The WSOP made legends out of poker players the likes of Doyle Brunson, Bobby Baldwin, and Puggy Pearson. In addition, it paved the way for other professional poker tournament series, such as the World Poker Tour (WPT) and later on, the European Poker Tour (EPT). In 2011, poker officially gained recognition as a mind game after the International Federation of Poker was established in Switzerland. What is more, the fields such tournaments attract have grown tremendously. The 2015 WSOP tournament broke all records and became the biggest ever live re-entry event in history, attracting a mind-blowing field of 22,374 players. When it comes to popularity, poker shows no signs of slowing down anytime soon. As a matter of fact, this game of skill is now more accessible than ever, largely thanks to the rise of interactive gaming in the past decade or so. Hundreds of regulated, legitimate online casinos have emerged in recent years, allowing both seasoned players and novices to engage in a wide range of poker variations right from the comfort of their surroundings. Furthermore, there are a number of reputable specialized poker platforms which enable newcomers to join the diverse community by installing a secure poker client on their computers and going through a simplified, quick registration process. Players are now provided with the opportunity to put their skills and experience to the test by partaking in various online poker tournaments. 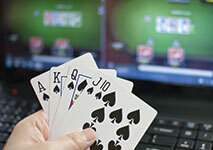 These are held on a regular basis, with PokerStars’ Sunday Million being the most prominent example. It is fair to say poker has now acquired the status of an absolute classic and easily earns the title of the most played card game in the entire world. What was once a game associated with the outlaws in the Wild West, now occupies an important spot in modern culture and is a favorite of millions of players the world over.